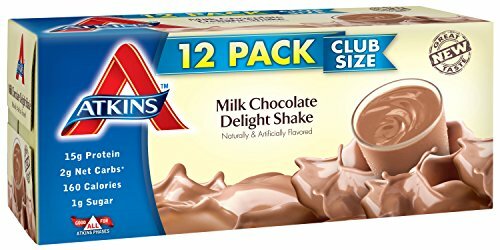 Atkins Ready To Drink Protein Shake – Atkins has been around for a long time and is a very well-known diet company that has helped improved lives since 1963, thanks to Dr. Atkins. Along with the controlled carbohydrate studies that help people lose weight, you can now grab one of their already made protein shakes to help you with your journey. Atkins shakes are no hassle – unlike the messy protein tubs, and are already premade in an easy to drink bottle for you. At only 160 calories, the Atkins Ready to Drink shakes offer 15 grams of protein with only 5 grams of carbs – all while delivering a smooth taste. These macros are perfect for both average men and women trying to lose a couple of pounds by drinking a lean source of protein and as a perfect recovery shake for any athlete. Athletes prefer drinks with these numbers because it gives them the recovery that they need for their muscles, while maintaining a lean diet so that they can preserve their body type or improve it. If you haven’t started working out in the gym, or are new to exercise as a whole, then a great time to drink this shake is first thing in the morning when you eat your breakfast. There are about 20% of your daily needs for vitamins and minerals, which is a great jumpstart for your daily nutrition. The 20% might not sound like a big amount at first, but you make up the other 80% through eating whatever you decide to consume throughout the day. It’s okay to achieve some of these vitamins through a pill, but the healthiest way is to consume a majority of your vitamins through your dietary intake. Perhaps one of the greatest reasons to give this shake a try is its tremendous value of less than $15 per 12 pack. That’s about half the price of what you would find it for in the grocery store, so it’s definitely a low risk investment that could further benefit your health. Some people have even reported it being helpful as a low carb and low calorie drink for those who have diabetes as well. It doesn’t matter if you’re just trying to lose a couple of pounds before a school reunion or if you’re trying to keep your sports body in shape. Atkins readymade shakes you can drink on the go will provide a lean and nutritious source of protein to keep your body fueled up and going until you achieve the results you desire.